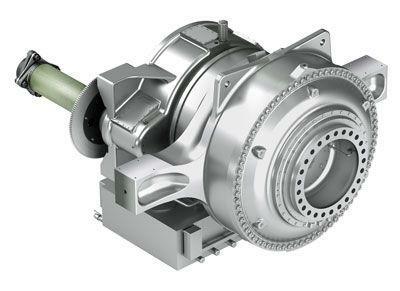 Renk presents two new products for the "EQ-Gear" transmission and the "EQ-Flex" couplings for Wind Turbines, The sliding bearing technology of the gearbox enables an enormous power density through ideal load distribution. Special materials and innovative coating processes ensure optimal operation. The intelligent planetary bearing ensures almost uniform load distribution in all operating conditions. The low variety of parts of the planetary gear concept guarantees high reliability. The mastery of extreme forces makes the low-wear plain bearings a sustainable alternative to conventional rolling bearings. There is no life-cycle restriction. The modular design also enables economic solutions for practically every application. The EQ-Gear is suitable for low and medium speed platform configurations in coaxial design and for the high-speed driveline with off-axis generator connection. Especially in the coaxial platform configuration, the necessary for pitch control lines can be easily guided between the input and output shaft through the transmission. Wireless temperature monitoring ensures remote monitoring of slide bearings. The optimal load distribution between the planetary stages is self-adjusting. The entire powertrain, consisting of the EQ-Gear transmission, the EQ-Flex clutch with integrated torque measuring system and the Condition Monitoring System VIB Monitor, can be optionally tested and validated on the in-house test bench. The gearboxes are certified according to IEC and GL guidelines. The torque limiter of the EQ-Flex coupling ensures torque limitation in case of overload. This increases the availability of the system and the operators profit from the freedom from maintenance and wear stability. The patented slip system ensures a variable and stable slip torque during operation. An adjustment of the slip torque is possible without disassembly of the clutch in the drive train or a new calibration in the test bench. The layer structure of the specially shaped lamellae compensates for axial, radial and angular offsets between drive and work machines without generating large restoring forces. The torque measurement is continuous.